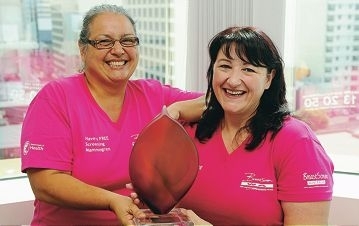 The group was a winner of the Engaging the Community category of this year’s Multicultural Community Leaders awards, announced on April 26, and Ms Schultz said adapting to linguistic and cultural needs were key to BreastScreen’s success. ‘We have information available in 33 different languages,’ she said. ‘When we have a lady come into the clinic who speaks another language, or who doesn’t have good English skills, we can provide interpreter services for free. Ms Schultz said it was important to actively pursue links with cultural groups.